Sacred Bodhi before c.1913 and in Recent Past. Jaya Sri Maha Bodhi (Sinhala: ජය ශ්‍රී මහා බොධිය) is a Sacred Fig tree in the Mahamewna Gardens, Anuradhapura, Sri Lanka. 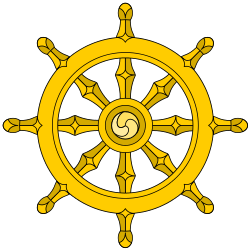 It is said to be the right-wing branch (southern branch) from the historical Sri Maha Bodhi at Buddha Gaya in India under which Lord Buddha attained Enlightenment. It was planted in 249 BC, and is the oldest living human-planted tree in the world with a known planting date. Today it is one of the most sacred relics of the Buddhists in Sri Lanka and respected by Buddhists all over the world. Buddhists in the Island have had a practice of visiting and paying homage to the most sacred Bodhi tree since time immemorial. It is an annual custom for pilgrims from far-away villages to visit the city of Anuradhapura and to pay homage to the Sri Maha Bodhi. The caretaker of this site provides various offerings on a daily basis since time immemorial. The Buddhists in general have a strong belief that offerings made to the Jaya Sri Maha Bodhi have produced significant and positive changes in their life. It has also been customary for many Buddhists to make a special vow before the Jaya Sri Maha Bodhi for the safe delivery of their babies without malformations, to cure various ailments and for many other cures. It has also been a long tradition among farmers around Anuradhapura to offer the Sri Maha Bodhi tree the rice prepared from their first paddy harvest. They strongly believe that such offerings lead to a sustained paddy production with the least sufferings from drought, pest attacks including elephant damage. A Photo taken from the Lower Compound, Pahatha Maluwa. In the 3rd century BC, it was brought to Sri Lanka by Sangamitta (Pali; Skt. : Sanghamitra) Thera, the daughter of Emperor Asoka and founder of an order of Buddhist nuns in Sri Lanka. In 288 BC  it was planted by King Devanampiya Tissa on a high terrace about 6.5 m (21.3 ft) above the ground in the Mahamevnāwa Park in Anuradhapura and surrounded by railings. Two statues of Lord Buddha can be seen in the image-house; a stone-standing-statue is in the right side of the stone wall. The cobra-stone is a very rare creation, showing the embossed figure of cobra. Several monolith heads with plain incisions are in this religious site. Ruins of an ancient building called Mayura Pirivena (Mayura Monastery) have been found to the south-west of the Jaya Sri Maha Bodhi, and the ruins of a stupa called Dakkhina Tupa (Southern Monastery) can be seen nearby. According to the ancient chronicles in Sri Lanka, some walls and terraces had been built surrounding the sacred tree at some time in the past. Mahavamsa states that King Gothabhaya (249 – 262 AD) built a rubble wall. Dipavamsa reports that a rock-laid terrace and a lattice wall was built by King Kirthi Sri Meghavarna (302 - 330 AD). During excavation for reconstructing the present wall, the rubble wall with its foundation created by King Gotabhya, and the rock-laid terrace together with a lattice wall constructed by King Kirthi Sri Meghavarna were found. These were preserved at place, and were opened to public in January 2010. Two branches of the sacred tree were broken during separate storms in 1907 and 1911. An individual cut down a branch in 1929. Tamil Tiger separatists shot and massacred a number of Sinhales-Buddhists on the upper terrace in 1985. This incident is known as the Anuradhapura massacre. ↑ Shanika Sriyananda (2011-07-03). "Caring for the Jaya Sri Maha Bodhi ". Retrieved 2013-05-08. ↑ Weerakoon, Rajitha (11 December 2011). "Sanghamitta Theri forged the liberation of Lankan women". SundayTimes. Retrieved 9 May 2013. ↑ Pelpola, Charith (16 August 1998). "Oldest sacred symbol". SundayTimes. Retrieved 9 May 2013. ↑ "The Coming of the Bodhi Tree to Lanka". Retrieved 2013-05-08. ↑ "19: The Coming of the Bodhi-Tree". Mahavamsa. Retrieved 9 May 2013. ↑ Sarathchandra, Vimukthi (1 December 2009). "Arrival of the Bo-tree sapling". DailyNews. Retrieved 9 May 2013. ↑ Wickramage, Florence (25 April 2002). "Mahamevuna Royal Gardens to regain ancient glory". DailyNews. Retrieved 9 May 2013. ↑ "Then and now, spreading its sacredness worldwide". SundayTimes. 20 February 2011. Retrieved 9 May 2013. Wikimedia Commons has media related to Jaya Sri Maha Bodhi.